We are continuing to process the Community Services Division files from Federation, which are still turning up in storage under various descriptions. One subseries in work right now are the remaining files of Joseph Harris, from the 2nd half of his 12-year tenure with Federation. Harris was hired in 1975, probably as the Consultant for Jewish Education and Community Centers. Titles and responsibilities evolved through the early and mid-1980s, when all of the Community Service [staff] “Consultants” were renamed “Social Planning Consultants”. By 1984 he had become the Associate Executive Director of Community Services (“with prime responsibility for Jewish Education and Culture, Community Centers and Camps”), and assumed the position of Executive Director of Group Services and Jewish Education in September 1985. Many of the files now in work date from his roughly two years in this last position. 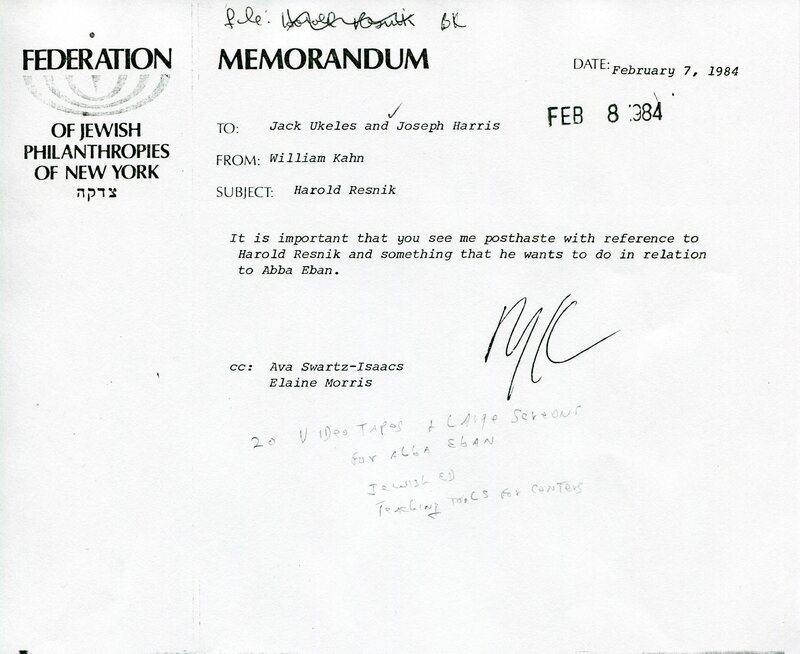 Harris remained at Federation through the transitions of the 1986 merger with UJA, and his files end in 1987. Two brief memoranda surfaced this week in Harris’s files, insignificant in content of his actual “work”, but telling about the time period and the people involved. For us, these clues and traces in the files serve to humanize the people whose correspondence and reports and memos we gain such familiarity with, in the absence of ever having actually met the person. Both memoranda are from Harris’ “William Kahn” file; long-time readers of this blog may remember Kahn as one of the Federation Executive Vice-Presidents Harris would have worked under, 1981-1986. For those of us in charge of our own phone calls by 1983, you may remember that time as the early days of home answering machines, and answering machines in offices. And how it took a long time to even adopt a consistent name for what this machine really was. The fact that Harris referred to it as a tape recorder nicely dates the memo. Please note the discoloration from a rubber band diagonally across the blank part of the page. When is the last time you received a note with the word “posthaste” in it? Handwritten below the memo, no doubt from the resulting meeting with Kahn, is “20 videotapes and large screens for Abba Eban Jewish Ed Teaching tools for centers”; one can only assume that the hurried meeting led to the results Kahn was hoping to achieve. For Merriam-Webster’s definition, see: http://www.merriam-webster.com/dictionary/posthaste. Elsewhere in the Harris files an “aide memoire” was glimpsed, something that we saw more of in the financial files from the 1950s and 1960s earlier in the project (and posted about on this blog), but Harris’ appears to be the most recent citing within Federation’s files. Prior to his arrival at Federation in 1975 Harris had been the Executive Director of the Staten Island JCC; after Federation his career continued at the Jewish Community Center Association and other Jewish communal organizations. Please let us know if you have additional information about Joseph Harris’s career as it relates to the Jewish Education and Community Center work he did at Federation. Harris received the Allan Weissglass award from the Jewish Community Center in Seaview (Staten Island); other biographical information and a photograph are included in the article. 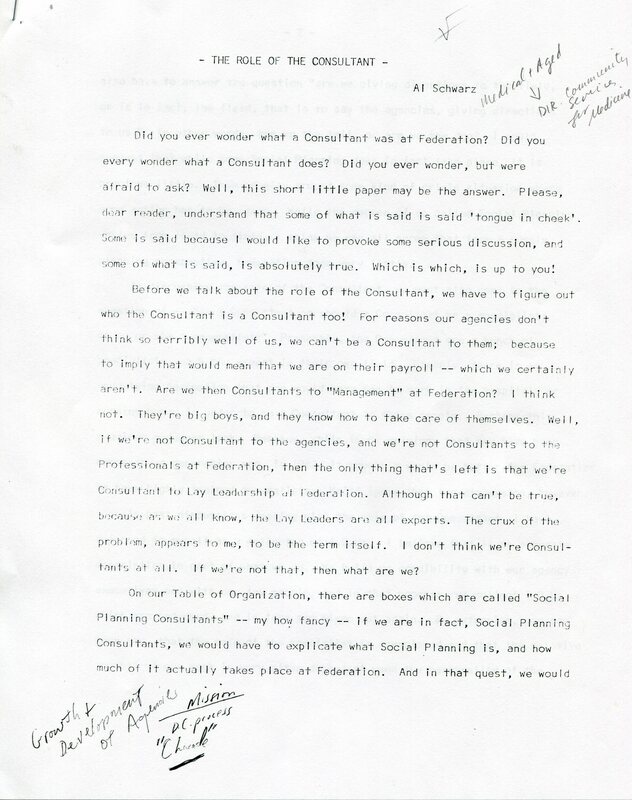 While working on this collection over the past three years one thing we initially found confusing was the label “consultant” applied to the professional staff who headed Federation’s Community Services Department, particularly in the 1950s, 1960s and 1970s. Various staff members, experienced professionals all and at the top of the their respective subject fields in New York’s social services realm, included Martha Selig, Donald Feldstein, Graenum Berger, Joseph Harris and Al Schwarz. The work and papers of a number of these consultants have been discussed in previous blog posts. Eric recently located a thought piece by Al Schwarz from circa 1982; Schwarz was then the Director of Community Services for Medicine in that subseries of Federation’s Community Services material. 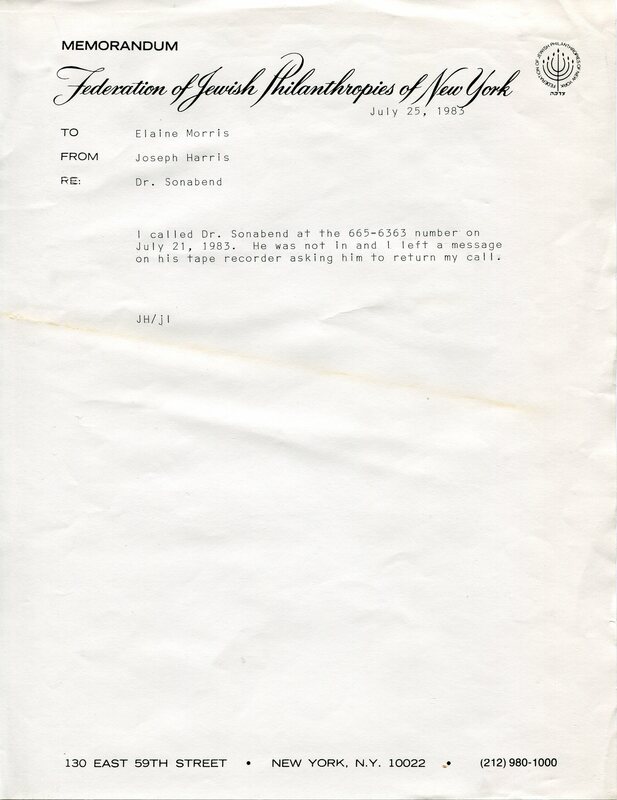 In this informal report, entitled “The Role of the Consultant,” presumably written for discussion in a department meeting, Schwarz teases out the role of the consultant and ponders a change in title. He describes the report as “tongue in cheek,” announces that he wanted by writing it to “provoke some serious discussion” and that “some of what is said is absolutely true.” The manner is very breezy and irreverent, no doubt reflecting Schwarz’s familiarity and exasperation with the subject and, perhaps, with Federation’s existing organizational structure. Eventually the term “consultant” was retired, having evolved into the more usual titles of Director and Executive Director. By the time of the merger with UJA in 1986 most departments and divisions had also changed names. As our project moves more completely into the post-merger portion of the collection, we find ourselves attempting to correlate the functions of the professionals and their departments that have become familiar to us, with what those same people and functions eventually became. With the assumption that neighborhoods are the basic building block of vibrant Jewish communal life in the metropolitan area, the Federation provided aid, both technical and financial, to specific neighborhoods and Jewish Community Councils within those neighborhoods in Brooklyn, Manhattan, Queens, and the Bronx. The Federation worked proactively with “neighborhoods that are at risk of decline, yet are still basically healthy” to ensure that the Jewish population in that respective neighborhood would continue to thrive, commercially and communally. Target neighborhoods, at the time, included: Co-op City (Bronx), Kingsbridge-Moshulu (Bronx), Pelham Parkway (Bronx), Bensonhurst (Brooklyn), Boro Park (Brooklyn), Canarsie-Starrett City (Brooklyn), Crown Heights (Brooklyn), Flatbush (Brooklyn), Kensington (Brooklyn), Williamsburg (Brooklyn), Lower East Side (Manhattan), Washington Heights-Inwood (Manhattan), Forest Hills-Kew Gardens-Rego Park (Queens), Flushing (Queens), Jackson Heights (Queens), and Far Rockaways (Queens). One such relationship that developed between Federation and the local community happened in the Bronx with the Jewish Community Council of Pelham Parkway. 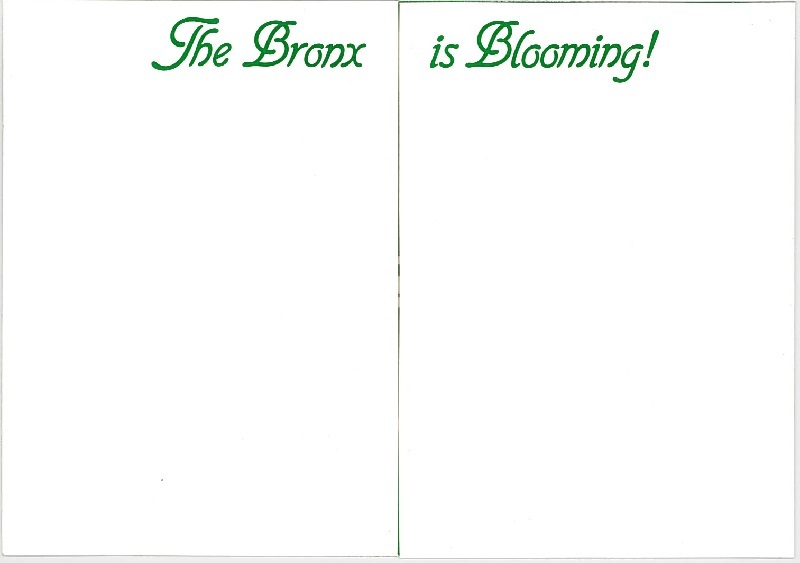 In 1984, Federation and the Jewish Community Council of Pelham Parkway coordinated the “Bronx is Blooming” tours to showcase some of the program’s achievements in Pelham Parkway. Achievements that included new housing for the elderly at Beth Abraham Hospital, coordinating renovations and co-op conversions, assisting with the revitalization of the shopping district near Lydig Avenue and White Plains Road. We are processing the files of Joseph Langer, Director of the Neighborhood Preservation Program and Project Renewal, and expect to receive another large shipment of materials related to Langer and the program later next week. Neighborhood Preservation Programs and their associated activities, including Federation’s own program, are not without controversy, but we aim to provide description and access to the archival material that document Federation’s efforts to re-invigorate specific neighborhoods in Queens, Manhattan, Brooklyn, and the Bronx. There was no mention of Staten Island neighborhoods in the folder titled “Neighborhood Preservation — Target Neighborhoods, 1982-1983”. If there is an inference to made based on the exclusion of Staten Island from the list of target neighborhoods, it is unclear what that inference might be. Further conversation shows that by December 31, the Executive Director of the agency in question had received Harry’s resignation.